< City Tours in Venice: guided walking tours to explore the City of Venice. This is a very enjoyable and relaxing excursion that will take you to explore the three most famous islands of the Venetian Lagoon. Many different characteristics of Venice are in fact combined in this tour: the natural beauty of the Lagoon, unique craftsmanship, genuine fisherman village atmosphere and the history and monuments of the earliest days. Murano became the center of glassmaking since 1291, and this traditional activity still preserves the original techniques of the past. You will admire the glass masters at work while producing the beautiful objects which have made them famous the world over. 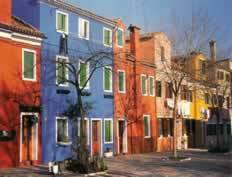 Burano is a cheerful and populous island located in the northern side of the Lagoon. Its brightly painted houses give it the air of an Italian opera set, while the success of its most important industries, lace making, fishing and boat building, accounts for the well-being of its people. Torcello can be considered the “Mother of Venice” and was settled between the 5th and 7thC by the fist waves of refugees escaping from the Barbarian invasion on the Mainland. Today the island is nearly uninhabited (residents reduced to 12 souls). Covered by a rich typical Lagoon vegetation, the island preserves the most ancient monument of the lagoon: the solemn Basilica of Santa Maria Assunta, founded in 639 and rebuilt in 1008, ornated with the most impressive Byzantine mosaics . We can arrange lunch in Burano or Torcello, where you find some of the best Venetian restaurants.